“Everyone who has been allotted permanent account number as on the 1st day of July, 2017, and who has Aadhaar number or is eligible to obtain Aadhaar number, shall intimate his Aadhaar number to income tax authorities for the purpose of linking PAN with Aadhaar,” CBDT said in its release issued today. New Delhi: A day after the Supreme Court exempted those who did not have Aadhaar from linking it to their PAN card, the Central Board of Direct Taxes (CBDT) said the unique identification number would be mandatory for filing Income tax returns from July 1. The tax body further said that Aadhaar would be required while applying for new PAN from the beginning of next month. Reacting to the Supreme Court order released on Friday, CBDT said it provided only partial relief to those who do not have Aadhaar. As per the SC orders, it said, government would not be cancelling the PAN of those who fail to link it with Aadhaar. “Their PAN will not be cancelled so that other consequences under the Income Tax Act for failing to quote PAN may not arise,” said CBDT, the policy-making body of the Income Tax department. 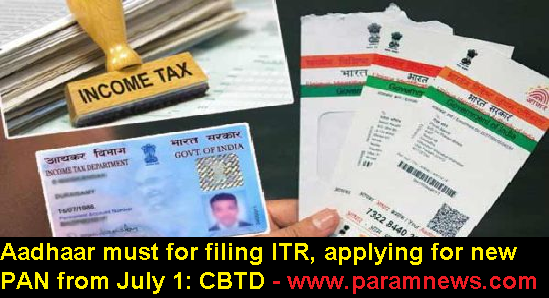 However, it clarified that those who still do not have Aadhaar would be required to submit their Aadhaar enrollment number for filing I-T returns from July 1. ““Everyone who has been allotted permanent account number as on the 1st day of July, 2017, and who has Aadhaar number or is eligible to obtain Aadhaar number, shall intimate his Aadhaar number to income tax authorities for the purpose of linking PAN with Aadhaar,” it said. An IT official, while speaking to PTI, said the decision of apex court was intended to prevent the cancellation of PAN as it would lead to numerous legal consequences. Officials also confirmed that Supreme Court’s order issued yesterday was studied by legal experts of Law Ministry, Finance Ministry, CBDT and the Income Tax department, before the statement of clarification was issued by CBDT today.